"To understand me, you must understand Norway." Henrik Ibsen's famous observation about his own work was taken to heart by a team of researchers from the Arts this summer. And their visit to the land Ibsen immortalized in Peer Gynt took them deep into the extreme landscape of Norway, from fjords to mountains, through midnight performances and across haunted bogs. There, accompanied by experts and Ibsen scholars, they gained in-depth experience of the folkloric forces that permeate Ibsen's works. This field work served to deepen production plans for the Gynt Project, an upcoming multi-venue production, conference, and gallery exhibition. The Gynt Project is a collaboration among Theater Arts, DANM, and Music faculty, international scholars, professional artists, and DANM and Theater Arts students that will bring Ibsen's work to the UC Santa Cruz campus. The experimental production of Peer Gynt will play on multiple stages and sites in conjunction with a three-day conference of top Ibsen scholars from around the world. To prepare for this ambitious multi-disciplinary venture, researchers joined the Gynt Project director Kimberly Jannarone for an unforgettable week of trekking, discussion, festival-going and transformative insight into the world of playwright Ibsen and his mythic inspiration. The group first convened in Oslo where they met with prominent Ibsen scholars and toured key sites, like the Ibsen Museum and the Grand Hotel, where Ibsen spent every afternoon of his last few years. They met with the Ibsen museum’s director Erik Edvardsen, as well as the head of Ibsen studies at the University of Oslo, Vgdis Ystad, and the preeminent folklorist and historian Sverre Mørkhagen. Edvardsen personally took them through Ibsen's home in Oslo, answering all their questions about his writing habits, literary rivalries, and interpretations of his work. Mørkhagen led the UCSC research group to many actual sites that figure prominently in Ibsen's life as well as the tales of Peer Gynt. "We got the tour," Jannarone admits appreciatively. Another feature of this field work was the melding of life and art. Professor Danny Scheie, himself half Norwegian, tracked down the ancestral Scheie farm. It turns out it is right next to the historical Peer Gynt farmhouse. No coincidence that this son of Norway is the perfect fit for the role of Peer. For more details about the research journey to Norway, and the upcoming production, see The Gynt Project website. 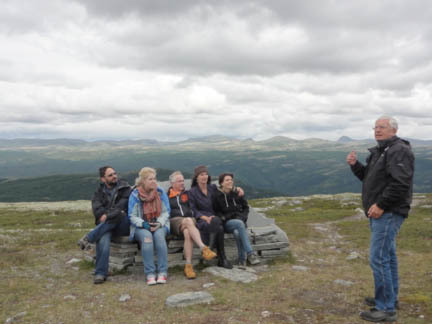 The summer 2012 research tour to Norway was partially funded though grants from the Arts Research Institute, Vice Chancellor for Research Bruce Margon, the Academic Senate Committee on Research, Porter College Undergraduate Research Grants, the Norwegian Consulate, and Arts Dean David Yager.